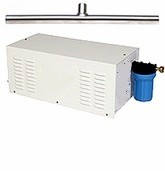 Commercial Misting systems are used for restaurants, day-care centers, produce misting, resort misting. We are the market leaders in professional installation of commercial misting systems, with our highest standards of misting kits. Pre-threaded nozzle risers allow ease of installation in any location. Great for large warehouses, manufacturing facilities, foundries, industrial plants, refineries, garbage sorting facilities and construction sites. Durable stainless steel mist line has life time warranty and is rated for 2000psi. This low maintenance, energy-efficient fogging systems is designed to perform consistently under the most extreme conditions. Evaporative Air & Direct Heat Exchange Pre-Cooling: Here we use lower pressure pumps, larger atomizing nozzles and automated controls to achieve a combination of air cooling and direct Heat Exchange water cooling. Our Pre-cooling Systems can be used on any air-cooled AC/refrigeration, Cooling Towers and other equipment For more information or for formal quote.